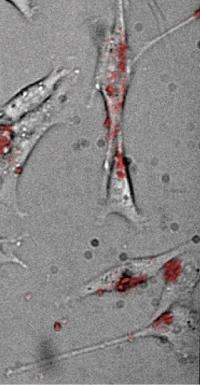 Researchers are using quantum dots (shown in red) to take the temperature of living cells.Credit: Haw Yang, Ph.D. Using a modern version of open-wide-and-keep-this-under-your-tongue, scientists today reported taking the temperature of individual cells in the human body, and finding for the first time that temperatures inside do not adhere to the familiar 98.6 degree Fahrenheit norm. They presented the research at the 242nd National Meeting & Exposition of the American Chemical Society (ACS), being held here this week. Yang said that information about the temperatures inside cells is important, but surprisingly lacking among the uncountable terabytes of scientific data available today. Scientists long have suspected that temperatures vary inside individual cells. Yang explained that thousands of biochemical reactions at the basis of life are constantly underway inside cells. Some of those reactions produce energy and heat. But some cells are more active than others, and the unused energy is discharged as heat. Parts of individual cells also may be warmer because they harbor biochemical power plants termed mitochondria for producing energy. The researchers got that information by inserting the nano-thermometers into mouse cells growing in laboratory dishes. They found temperature differences of a few degrees Fahrenheit between one part of some cells and another, with parts of cells both warmer and cooler than others. Their temperature measurements are not yet accurate enough to give an exact numerical figure. Yangs team also intentionally stimulated cells in ways that boosted the biochemical activity inside cells and observed temperature changes. Yangs team is now conducting experiments to determine what regulates the temperature inside individual cells. One goal is to apply the information in improving prevention, diagnosis and treatment of diseases.